Maria's, unfortunately, is very rarely on my way to or from anywhere, but after my first promising visit when they opened in August, I returned yesterday. There are a few comments about Maria's in the Han 202 thread, and even not having really known its previous incarnation, I understand the skepticism about the new Maria's. The bar itself has a very intimate feel, with maybe 10 stools at most, all occupied for the two hours or so I was there yesterday. (There are also tables in the back.) The crowd seemed fairly mixed last night, from a self-described "dinosaur of Bridgeport" intent on reassuring me that the US military would always keep me safe, to some couples maybe my parents' age who looked like they were having pre-dinner drinks, to some hipsters. I don't know very much about beer, but I was impressed by their offerings. Also, my drinking companion said that $5.50 for a Bell's Batch 10,000 snifter at Maria's was the cheapest he's seen in town. On Wednesdays, all of their cocktails are $1 off. The Sazerac I had was really lovely. For the past few Wednesdays, Maria's has also had DJs spinning world music. Frank Orrall of Poi Dog Pondering and Thievery Corporation was the guest DJ last night. I enjoyed the music, which was kept at a pretty low volume, so conversation remained very easy. I think the "Global Soul Nights" are done, but, from their website, it looks like Maria's keeps a pretty full music calendar. The weekly Global Soul: World Beats & Treats continues with host DJ Joe Bryl and a special guest from some of Chicago's most knowledgeable world beat collectors. Guests for Feb 2011 are Aaron Cohen of Downbeat magazine, Dave Hoekstra of the Chicago Sun Time, Tony Sarabia of WBEZ and musician Paul Cebar from Milwaukee. There is no cover charge for the entertainment. March begins with a tribute for Serge Gainsbourg with a special video presentation. joe bryl wrote: The weekly Global Soul: World Beats & Treats continues with host DJ Joe Bryl and a special guest from some of Chicago's most knowledgeable world beat collectors. FYI for those interested: it's every Wednesday at 8pm and no cover. Thanks for posting, Joe. I miss Sonotheque. Now that baseball season is underway again, I'm spending more and more time at Maria's when I'm in Bridgeport for games. I'm not a fan of super crowded bars, so I prefer to avoid it on weekends, but it really is a gem with great bartenders and a terrific selection of beers on tap. Their access to Three Floyd's is particularly exciting and you often run into the guys from Founders at Maria's since they have a good selection from them as well. Recently, they have had Zombie Dust, although I believe it is probably gone by now unless they managed to score some more. It really has been a treat, I'm positively addicted to the stuff. I also love their bourbon/scotch/rye selections, it is very impressive. The bartenders are happy to let you try "sample" sizes of just about anything and their recommendations are pretty spot-on. I just wish I lived closer so I could spend more time here. I should note that I used to drink in here post-games when it was still Kaplan's and that I'm somewhat baffled by the objections to the "clean up." I love a dive bar as much (probably more) as the next gal, but it's still owned by the same family and run as a family operation. Maria herself is still front and center (and still doling out bites of whatever she is eating as she oversees the front room), so although it's been gussied up, it still has the same feel to it. Anyway, thought I'd show some overdue LTH love for a really fantastic little place and encourage others to check it out. I'm glad you posted this. I'll be there--maybe I'll catch you! happy_stomach wrote: I'm glad you posted this. I'll be there--maybe I'll catch you! 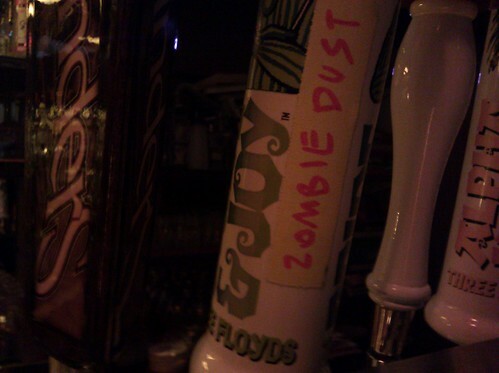 You won't be able to miss me - I'll be the one parked by the Zombie Dust. I've never been to Maria's before, but I'm going to this. From the info on their website, it sounds like there are sort of two events going on at once. One at the bar where everything is a la carte, and another at their art gallery, with a $15 cover, but all you can drink. Are the beer lists the same? Different? Does anybody have a suggestion of where it is best for me to go? 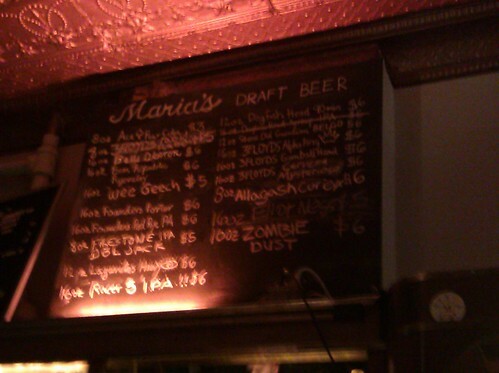 I assume the overall selection will be better at Maria's, but I could be wrong! DClose wrote: I've never been to Maria's before, but I'm going to this. In the same boat...never been, plan on going. It's dependent of what time I get down there and the crowds, but I'd like to check out both. Obviously the art gallery thing sounds like a hell of a deal, but if it's too crowded, I'll just be at the bar. I hope you both made it out to Maria's and maybe ran into Ursiform. Of course, she found me at the bar, drinking and stuffing my face with pasty and gravy chips from next door. That was as full as I've ever seen Maria's, and though I had to leave for Fringe Fest before the gallery party started, it sounds like that was very well attended as well. I love Maria's. Oh, golly gee, did we have some fun! My head is still reeling, but I'll come back and post about some of the beers we sampled. The local craft breweries were out in full force, it was amazing to talk to the good people that make all of these wonderful beers and hang out with some truly exceptional company. Maria's - not just a bar. It's a force for all that is good and wonderful and community-oriented in the truest sense in this world. I have to echo Happy Stomach's thoughts....I love this bar and everything they are doing. Get thee to Maria's, people. A friend and I visited Maria's a few months ago and I can't believe I haven't made it back yet. We were there on a weekday night and it wasn't very busy. Maria was wandering in and out, and each time she wandered in, she had a different kind of food in her hands, which she kept pressing on my friend and I. First, it was a brownie. Then, it was cauliflower, and she ended the night by giving us some cookies. It was bizarre and entirely delightful. We also had a conversation with her about 7-UP, but I cannot recall what exactly we discussed. I enjoyed Maria's. They're touted for the massive beer list, but they have an impressive spirits collection as well. We counted 22 ryes. I was feeling like a hot drink when we visited on a cold night recently. They had two, and I found the mulled hard cider very satisfying. My husband rented out Maria's on Thursday night for his company Christmas party and it was a roaring success!!! Everyone there was so gracious and accommodating. It was the quintessential Chicago evening. Most of the food came from next door and it was excellent as well. They had a photo booth in the back and a black dog gelato cart up front. Later in the evening pizza from Connie's was delivered to soak up the copious amounts of alcohol. They were terrific about calling cabs to get people home after the event. I think the gelato girl and the photo booth guy even made a love connection! Everyone agreed it was the best party the company had ever had and apparently the best volume night for Maria's thus far! This is a very special place and only wish we lived closer! I live on the northwest side of Chicago. But Maria's is a bar I make the effort to get to sporadically. Yes, I take transit. It usually culminates in some groin clenching rides back to the domicile ; but this is something I'm striving to improve. To be succinct, prices are much below average. Ed Marzewski is now cultivating a relationship with the Half Acre Brwy., which brewed its "The Chairman" specialty beer. I encourage you to sign up for its E-Mail list. You will get non-food & drink missives. If anyone is new to this thread, I will note that the venue has a “progressive” sociological vista, similar to that of The Heartland Cafe and its bar bar, The Red Line Tap. I am bringing a group of 10-12 to PHB on Saturday around 6:30 or 7:00. Will we be able to eat at Marias or should we just eat at PHB and then go to Maria's afterwards for drinks? Any recommendations are appreciated. jfibro wrote: I am bringing a group of 10-12 to PHB on Saturday around 6:30 or 7:00. Will we be able to eat at Marias or should we just eat at PHB and then go to Maria's afterwards for drinks? Any recommendations are appreciated. Based on a Saturday visit a month or so ago at the same time of day it would be tough to get a group that size into PHB. We went to Maria's after and while Maria's doesn't serve food, PHB was bringing food right into Maria's not sure how that works but I think it'd be the way to go. PHB has pretty tight dining quarters. I'd go to Maria's, secure a table, then send a few people over to PHB to do the ordering/paying. Let them know you are eating next door and they'll come find you whether you are inside or on the patio. Yep, agree on PHB. We were there Saturday and a group of 8 took up near 3/4ths of the restaurant, so your best bet is to eat at Maria's. Maria's was a delight and the perfect choice. Way more atmosphere for our dinner, and plenty of seating (though by the time we were done around 7:45 the place was full and you would have been standing if you went there to wait for your steak and ale pie). Excellent, unique draft selections (Zombie Dust!) from a helpful staff. Wish it was closer to me, though worth the trip. Madon! This thread has not been updated in five years? I think you have heard that Chicago Magazine called Maria's "the best bar in Chicago". A few years ago, the place was expanded eastward along 31st St. There's a larger bar and table area (with more craftbeer taps ) there. It has a one-way path into "Kimski", a Polish-Korean restaurant, which has intriguing cuisine, both carnivorous and vegetarian. I am still visiting here on occasion. I learned after a while that the route #62 Archer bus, which has 24-hour service, is 2¾ blocks away when you go west-northwest via Bonfield Ave.
With Kimski opening, you cannot bring in food anymore, and prices have risen to where I would now consider them average. But you should go here.